Juel Tide Gates is dedicated to life-cycle engineering. We intend to be involved in the design, fabrication, installation, tuning, operation, and maintenance of our tide gates. Jeff Juel is a Seattle native who graduated from the University of Washington in 1985 with a Master’s of Science Degree in Civil Engineering. While completing his Master’s Thesis, Jeff was hired as a temporary employee at the Seattle District US Army Corps of Engineers. Eventually he was hired as a permanent employee and ultimately spent 15 years working for the Seattle District USACE. He was selected “New Employee of the Year” the year he was hired. He worked in Planning Branch for roughly three years during which he learned CADD. In 1989 he was assigned to be the Seattle District’s CADD Manager and given a GS-12 grade level. At the time he was the youngest GS-12 in the Seattle District. After a few years, Jeff left the CADD Manager position and worked in Design Branch where he was made the lead designer for the Aberdeen and Cosmopolis Flood Control Project. The design for this project had previously been brought to the Feasibility Level. The project included earth levees, flood walls, closure structures, wetland restoration work, and five pump station / tide gate structures. This was the largest flood control project undertaken by the Seattle District in the previous 25 years. As the lead designer, Jeff developed the General Design Memo for the project which included a number of cost-saving changes from the Feasibility Level Design. One of the most significant changes involved the design of unique side hinged tide gates. As the lead designer, Jeff was given a Special Act Award in July 1988. The bond measure to fund the local cost sharing for the project passed by a slim margin. The General Design Memo design was used to develop Construction Plans and Specifications. Jeff received a commendation for his work on the plans and specs. The contract for construction was ultimately awarded to Quigg Brothers McDonald of Aberdeen for just over 10 million dollars. There was concern that some of the features in the design - in particular the tide gates - were very non-standard. To more readily deal with questions that might come up during construction, Jeff agreed to serve as the Project Engineer during construction. At the time, having the Lead Designer follow a major project from design to construction and serve as the Project Engineer was unprecedented in recent history at the Seattle District. The project was completed on time in 1996 with very limited cost growth and an overall construction cost of $11 million. This total cost was very unusual compared to typical Federal Construction projects in light of the fact that Congress authorized this project with a maximum cost of $28 million. Jeff was recognized for exemplary service in June 1997 and was also nominated and won the Engineer of the Year Award for 1997 primarily due to his work on the Aberdeen and Cosmopolis Flood Control Project. After completion of the Aberdeen Project Jeff continued to work as a Project Engineer working on military construction at McChord Air Force Base. The work load at McChord AFB was substantial given construction associated with the new facilities supporting the new C-17 Transport Planes. Jeff ultimately was named Project Manager Forward for McChord AFB and the Seattle District USACE was named Air Force Construction Agent of the Year for 2000. In August of 2000, Jeff went to work for INCA Engineers in Bellevue Washington. He was responsible for the site design for the Howard Hanson Dam Juvenile Fish Passage Project. This project team received INCA’s Pinnacle Award for 2002. The following year, he was the Project Manager for a number of design projects for Walla Walla District including numerous Adult Fish Ladder modification projects associated with PIT tag detection. While at INCA, Jeff designed modifications to eight different fish ladders at several dams in Washington and Oregon. His design has become the standard for subsequent PSMFC Adult Ladder PIT tag detection projects. In 2003 Jeff was awarded INCA’s Pinnacle Award for his novel PIT tag design work at Ice Harbor and Lower Granite Dam. 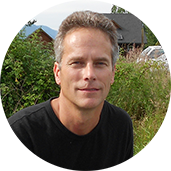 Jeff has worked on a wide variety of designs while at INCA including tide gate projects at Cherry Valley and the Chinook River. He also worked on producing the performance specification for the Fisher Slough Tide Gate project. While contemplating the Fisher Slough Tide Gate performance spec, Jeff conceived of the design for the Juel Tide Gate. On August 1 2008, Jeff left INCA Engineers and began Juel Tide Gates as a sole proprietor. Since leaving INCA, he fixed/modified the SRT at Port Stanley on Lopez Island and he is currently assisting Steve Hinton of the Skagit River Cooperative on a number of SRT projects for the Swinomish Tribe. Between August '08 and Febuary '09 Jeff retrofitted a total of four side-hinged flap gates with his new VBFGtm system. In January 2009 Jeff retrofitted the infamous Edison Slough tide gate. Skagit County, the Washington State Department of Fish and Wildlife, The Skagit Fisheries Enhancement Group and others have spent hundreds of thousands of dollars in two attempts to install a functioning SRT at this site. The latest failed attempt involved a GH-850 produced by Golden Harvest. The hydraulic system is currently disconnected and the JuelTide VBFG is connected in its place. The tide gate is now working great. It allows backflow on the rising tide, closes consistently at elevation 5.5 and opens on the falling tide when the water levels are equal. In December 2009 Jeff retrofitted a top-hinged fiberglass flap gate at Fornsby Creek with the VBFGtm system.